Valita Wilhoite has a continuing commitment to service and leadership to the Wright State University community that goes unmatched. Wilhoite was nominated for her dedication to service when she held the position of assistant director of the Office of Community Standards and Student Conduct and Student Support Services. She has since been named assistant director of student support in the Office of Disability Services. 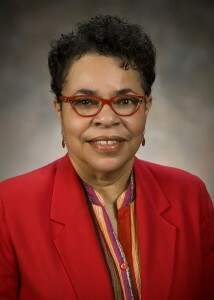 During her time as assistant director in her former office, Wilhoite was actively involved on committees and other internal organizations and volunteered both on and off campus. She is one of three chairs of the Strategic Planning Committee of the Veteran and Military Connected Student Committee. As a veteran herself, she is in a unique position to best understand and serve the needs of veterans and military-connected students. Wilhoite has also been the co-chair of the Student Affairs Diversity Committee and served on the Bias Incident Response Team—both of which have put her in a position to actively diversify Wright State. Wilhoite is also the staff advisor for the student organization Abilities United and has collaborated with the Rehabilitation Services Organization and the Special Olympics Club. As the advisor of the Veterans’ League, Wilhoite assists students with the transition from the military to civilian life and helps enhance camaraderie among student veterans while increasing awareness within the campus community of their unique life experiences. To say Wilhoite’s outreach to students is impressive would be an understatement. She is an effective counselor with numerous productive relationships with students of all kinds. Her interpersonal skills provide comfort to anyone who seeks it.